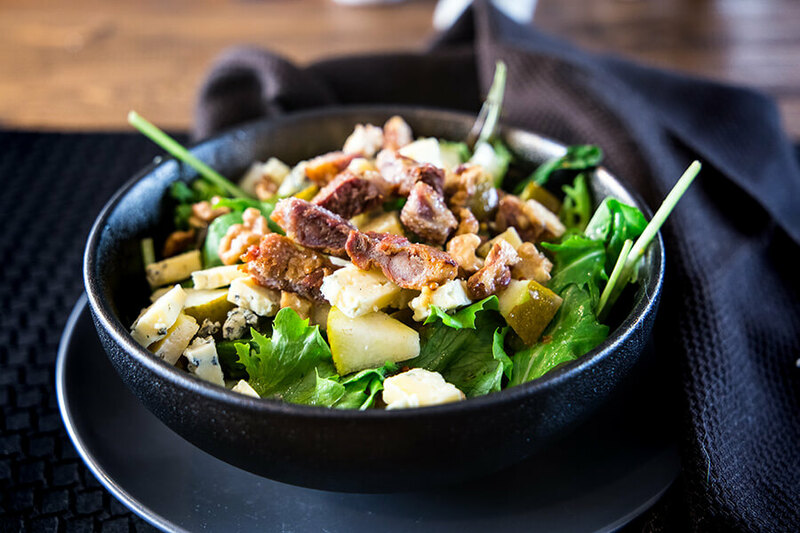 A delicious flavor packed salad filled with crispy pork belly, blue cheese, candied walnuts, fresh pear, and finished with a light vinaigrette. This salad is filling and so satisfying. My new personal favorite go-to salad. 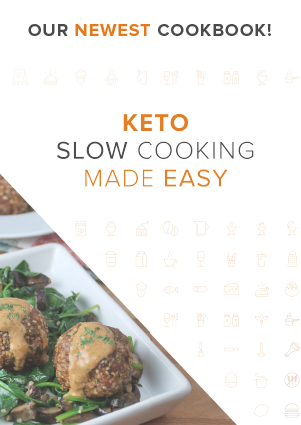 If you love your salads (and even if you don’t) and are looking for something both fresh, comforting, and keto friendly – then look no further. I enjoy this salad all year round. 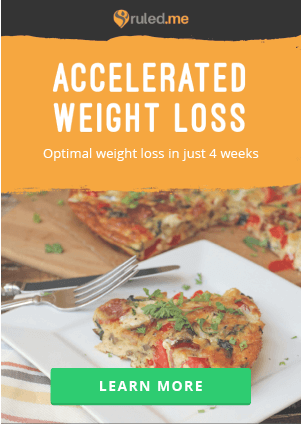 Try this salad with your own favorite keto salad dressing for an alternative. You don’t have to candy your walnuts if you want to whip up this salad quickly, but it doesn’t take long at all and adds a lovely bit of extra crunch and sweetness to the salad. Well worth it in my opinion. 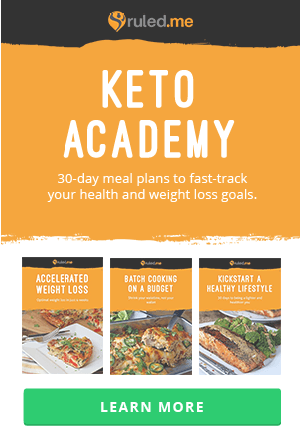 I haven’t tried to candy the walnuts with other sugar substitutes as the stevia (I use Natvia) works well but you could experiment with what you have. You can use your favorite blend of greens mix or simply lettuce if you prefer. Great as a weekend lunch, fresh summer dinner, or make a larger quantity if you have friends coming over. 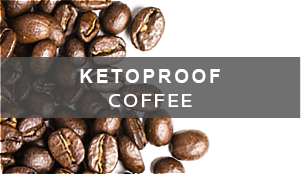 They are sure to love this and it’s very deceptive at hiding its high fat content so even your health conscience friends will love this! *You don’t have to use the wholegrain mustard in the vinaigrette but I like to add it in. 1. Turn your oven on to it’s broil setting. 2. Take your pork slices and cover with 1 teaspoon of olive oil and liberally apply salt to both sides. Cook in the oven until golden brown and crispy. Approximately 20-30 minutes. 3. 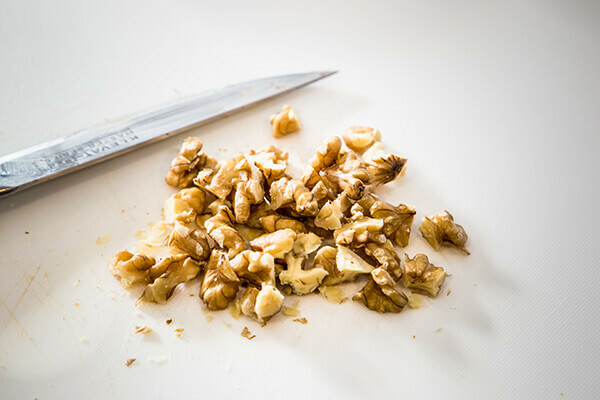 While you wait on your pork to cook, roughly chop walnut halves into smaller pieces. 4. Heat a pan over a medium high heat and add your water and stevia to the pan. 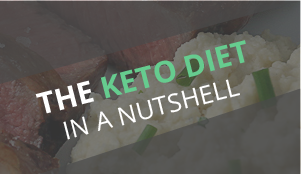 Wait for the stevia to dissolve and add your roughly chopped walnuts. Cook for approximately 5 minutes until the liquid has thickened and caramelized on the nuts. 5. Tip your nuts onto a tray to cool. Do not touch these as they will be very hot! 6. 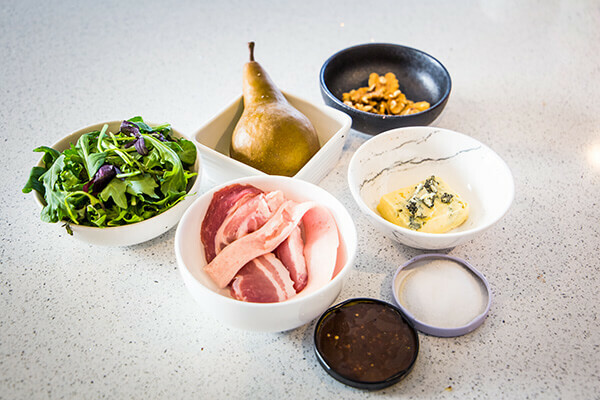 Chop your blue vein cheese and pear into bite size pieces and set aside. 7. Make your vinaigrette by adding mustards, white wine vinegar, and olive oil into a small bowl and whisk or mix with a fork until thickened and combined well. 8. 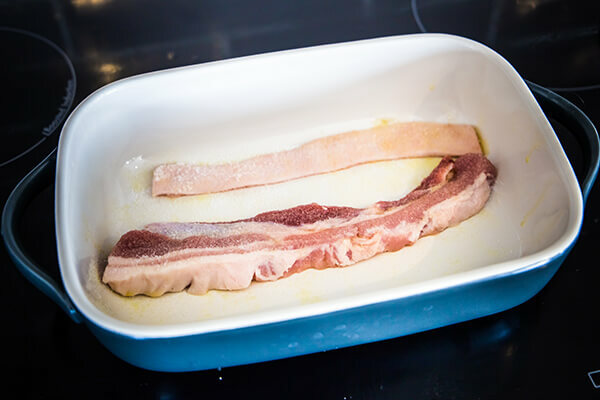 Remove your crispy cooked pork belly from the oven and allow to cool, then slice into bite size pieces. 9. 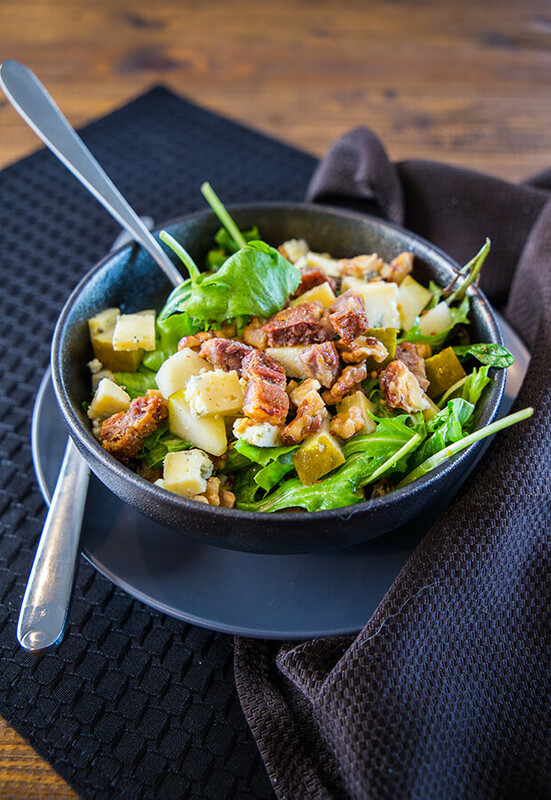 Toss your salad greens with the vinaigrette and top with sliced pork belly, candied nuts, blue vein cheese, and pear. 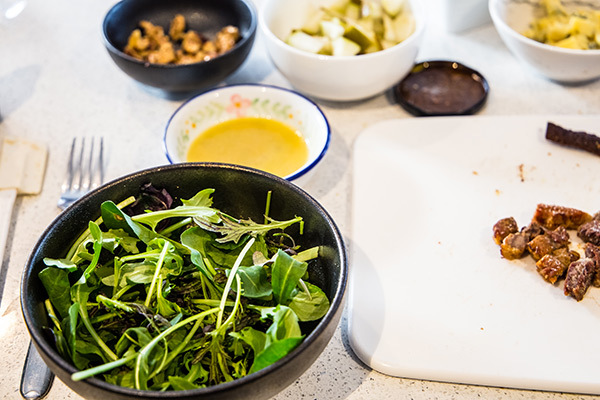 This makes a total of 2 servings of Crispy Pork Salad. 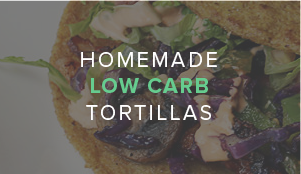 Each serving comes out to be 537.5 Calories, 51.46g Fats, 4.77g Net Carbs, and 12.74g Protein. Turn your oven on to it's broil setting. Take your pork slices and cover with 1 teaspoon of olive oil and liberally apply salt to both sides. Cook in the oven until golden brown and crispy. Approximately 20-30 minutes. 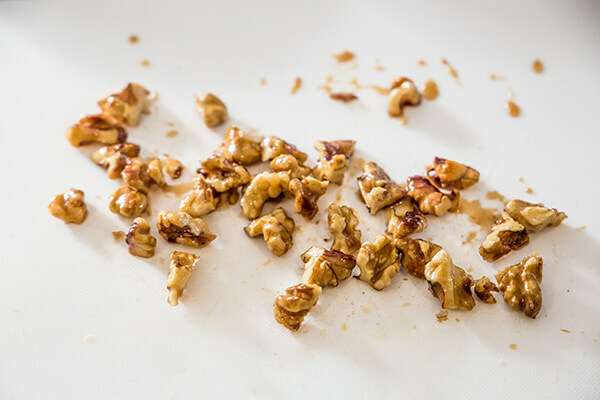 While you wait on your pork to cook, roughly chop walnut halves into smaller pieces. 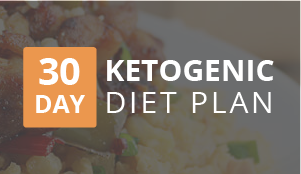 Heat a pan over a medium high heat and add your water and stevia to the pan. Wait for the stevia to dissolve and add your roughly chopped walnuts. Cook for approximately 5 minutes until the liquid has thickened and caramelized on the nuts. Tip your nuts onto a tray to cool. Do not touch these as they will be very hot! 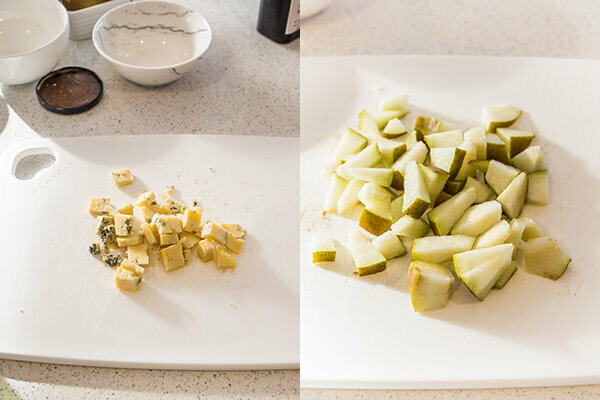 Chop your blue vein cheese and pear into bite size pieces and set aside. Make your vinaigrette by adding mustards, white wine vinegar, and olive oil into a small bowl and whisk or mix with a fork until thickened and combined well. 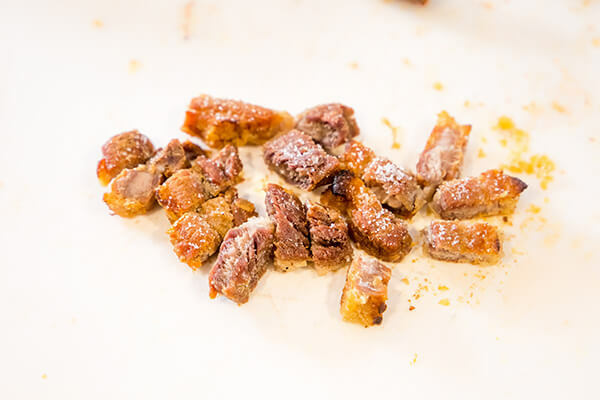 Remove your crispy cooked pork belly from the oven and allow to cool, then slice into bite size pieces. 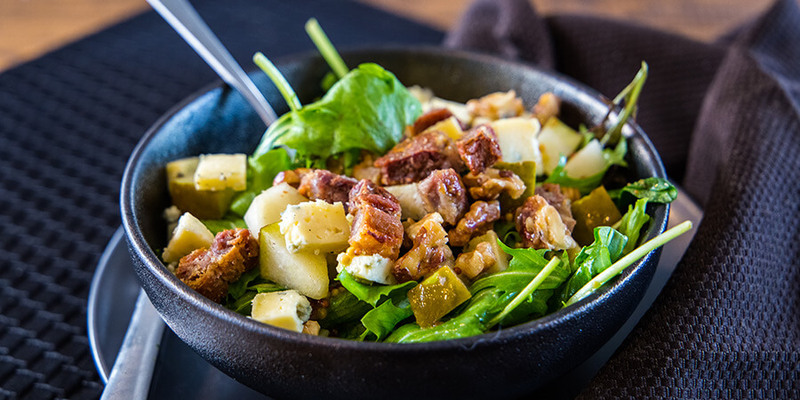 Toss your salad greens with the vinaigrette and top with sliced pork belly, candied nuts, blue vein cheese, and pear.